Skittles If playing off skittles, please contact the Caretaker for the key. All up to date! - The hall now has free WiFi for hirers – please ask for more details when booking. A projector is also available for hire. A local initiative, to bring halls across Devon together, enabling them to get together sharing ideas, information and good practise. Key speakers present on topical subjects. Paul Bailey has been representing Burrington and feels the meetings are beneficial. This is a quality standard for Devon Community buildings. 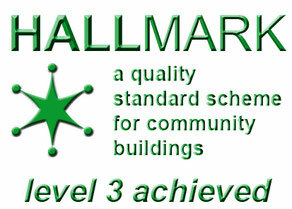 Following being awarded Hallmark 2, we are now going for Hallmark 3 – the final stage of this standard setting initiative. Stemming from the Hallmark and Hallshare, we are lucky to have a Hall Champion in our midst! This title has been awarded to Paul Bailey and means he will be able to advise other halls on funding and good practise and be part of a team that assess halls for their Hallmark. This body have been hugely instrumental in hall improvements through funding. See the magazine articles in the hall for more details. The recent 1st Aid and Food Safety courses were well attended and informative. Any other courses you would like to see in the hall? Please get in touch – details at base of page. If you would like to be involved in the running of the hall, please get in touch or come along to the AGM. 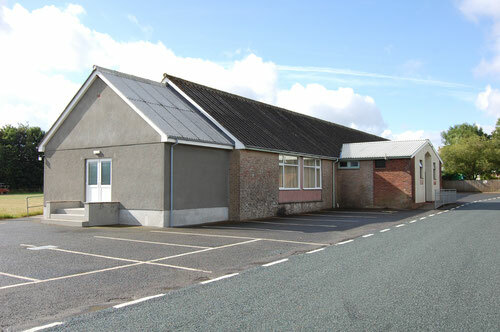 Regular users are, Comrades Club, Flex 'n' Fun classes, Women’s Link, Parish Council, Primary school, over 65's community lunch,Clubbersize and roller skating. There are fundraising events often held at the hall for various local organisations. Get in touch for more details. The hall has various rooms available for private functions, parties and meetings to suit your needs. You can also hire the entire building. All rooms are heated and have air conditioning. A fully fitted stainless steel kitchen is capable of cooking full dinner for 120 people. See 'facilities' tab for more details.